Just before leaving Lancaster to return to Pittsburgh after a pleasant Thanksgiving holiday with family, I glanced at the lead headline of the Sunday News and was surprised to see a lengthy article detailing a controversy about something near and dear to me, the Hempfield School District fifth grade Gettysburg Field Trip. I fondly remember my trip to Gettysburg in 1997 as a ten or eleven year-old at Centerville Elementary School, and credit it with helping spark my interest in Civil War history. The basic story is that in response to recent budget pressures some of Hempfield's seven elementary schools have cut field trips (with the Gettysburg trip getting the most attention). However, what has inflamed passions--and gathered 343 protesting signatures at last count--is that the district's superintendent required equity among the PTO-supported field trips, effectively constraining field trip spending in the more affluent elementary schools to what the less affluent schools could raise. It's a sad situation in which an elementary school rite of passage has become a casualty of the funding crisis. While hanging out with my wife's middle school-aged cousin last July at a family picnic, I was shocked to learn his elementary school in Hempfield had cancelled the trip when he was to go on it. Needless to say, we rectified that situation when I dragged him, my wife, and my in-laws over the battlefield three days later. Anyway, I don't know enough of the details to pick a side in this battle, but here are three thoughts. The Gettysburg field trip should receive high priority when making education resource allocation decisions. 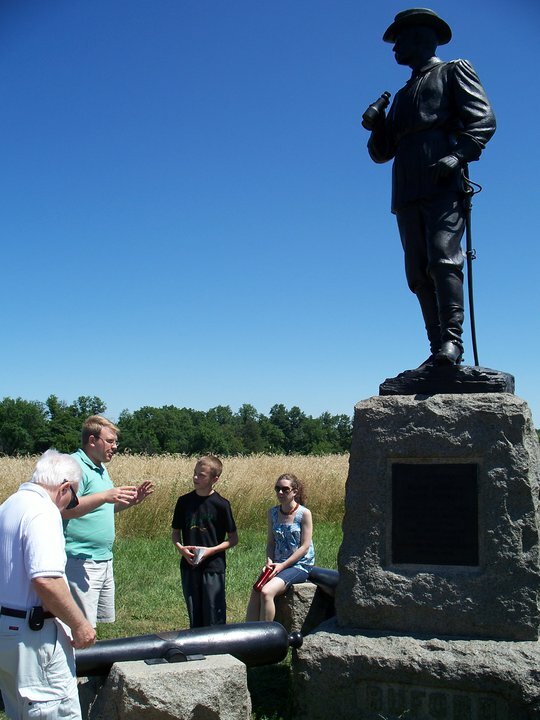 Gettysburg National Military Park is an awe-inspiring treasure perfectly suited for school field trips that energizes learning in the classroom. It boosts class morale, and I hypothesize it has small positive indirect effects on standardized test scores. I recall several of my classmates--not just the highest academic achievers--being inspired to read Civil War fiction and non-fiction in fifth grade. For some students, Gettysburg provides a place to forget the fatigue of the classroom and simply enjoy learning. Plus, I can't see how it'd be all that expensive (although my perception of education spending is probably a little off after spending a couple years in a business school), but I don't know the numbers. We should cherish the ideal of equal access to fundamental educational opportunities. I believe the district is sincere and correct in worrying that the inequity in field trips creates divisions within the district that are real and felt by students. I haven't sufficiently collected my thoughts to articulate precisely why I passionately despise a situation in which some elementary schools get to go to Gettysburg and others don't based on funding, but it somehow uniquely offends my sense of what fairness means for elementary schools that feed to the same middle school. Furthermore, East and West Hempfield Townships elected and many times re-elected Thaddeus Stevens--who may have done more than anyone else in Pennsylvania's history to advance public education and equity in education--and provided the "Greater Commoner" with his core constituency, so that should count for something. Hempfield's current field trip funding policy sounds miserable and designed to fail, or at least invite major controversy. It's unreasonable to solicit money from parents through PTO fundraisers and then not allow it to be spent on something educational that parents fervently support. The incentives for parents of students in affluent and average schools in this scenario seem to be out of whack. I guess it's one of the few times we can think of taxes as a virtue, as they avoid the messiness of trying to fund a public good with private donations. I wish a positive resolution for everyone involved, especially for the students in Hempfield's elementary schools whose fifth-grade Gettysburg trips are in jeopardy. On the other hand, I guess if the funding situation isn't resolved, maybe Hempfield schoolchildren will have to just go to the Thaddeus Stevens Historic Site (to be operational in Lancaster in a couple years) and learn about a man who championed the cause of equity and fairness in public education. Rohrerstown: Was the site of a major Republican Party meeting and torchlight procession of "Wide Awakes" supporting Lincoln just before the Election of 1860. Thaddeus Stevens delivered a speech for the occasion. Mountville: Was home to Corp. Elias H. Witmer of Company E, 79th Pennsylvania, whose letters to the Lancaster Express I am featuring on this website. Landisville: Was home to Capt. William D. Reitzel, who in 1862 recruited a company nicknamed the "Continental Blues" that became Company G, 2nd Pennsylvania Reserves. 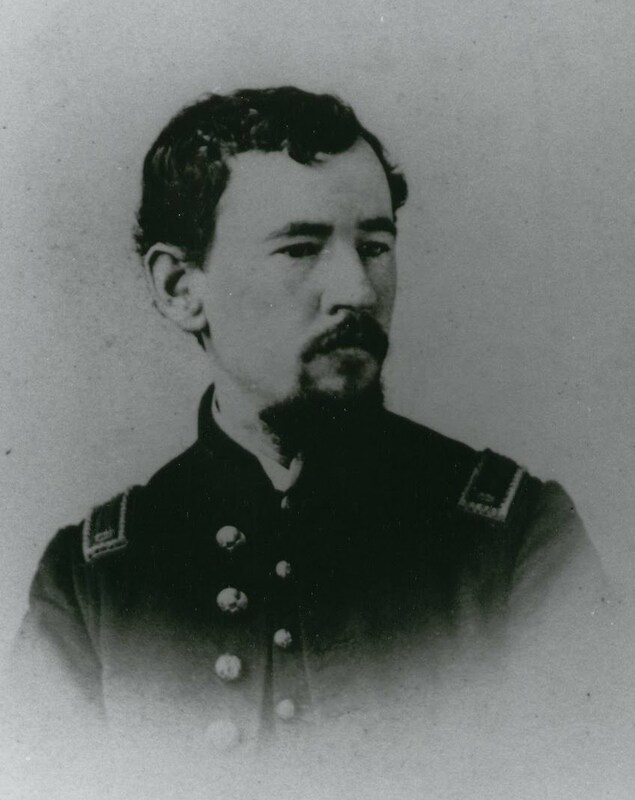 Reitzel authored letters to the Daily Inquirer during his service and was wounded in action at Gettysburg. I just found this note under "Dismissals" though from the 12/28/1863 New York Times: "Capt. WILLIAM D. REITZEL, Second Pennsylvania reserves, to date Dec. 7, 1863, for absence without proper authority, misbehavior in the presence of the enemy, and violation of General Orders No. 92, of 1862, by visiting improper places of amusement while under medical treatment." 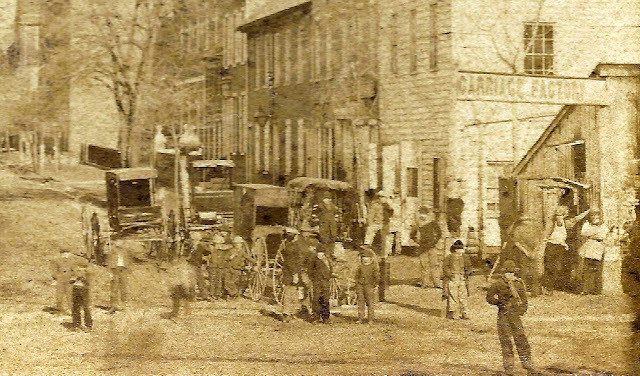 Centerville: Mr. Getz (as in the affluent "Getz's Woods" neighborhood) traveled to Gettysburg shortly after the battle either as a relief mission or as a sightseeing trip. The family farmstead at the corner of Sylvan Rd. and Harrisburg Pike was auctioned off in 2004 and included $10-20,000 of artifacts brought back from the Gettysburg battlefield that a Gettysburg antique dealer bought and resold on Ebay. It also included a few other Civil War era items, and my wife now has two Paisley shawls from the auction. Farmdale: Was where Lieut. Jacob H. Witmer of Company E, 79th Pennsylvania, taught school before enlisting in the "Normal Rifles," a company composed of many schoolteachers with connections to the Millersville State Normal School. Two letters he wrote from camp in late 1861 and early 1862 to a schoolteacher friend in Silver Spring were auctioned off on Ebay a few years ago. East Petersburg: Was home to Pvt. Josiah A. H. Lutz of Company B, 1st Pennsylvania Reserves, was mortally wounded at the Battle of Fredericksburg at the age of fifteen or sixteen. He is buried in the East Petersburg Mennonite Cemetery. 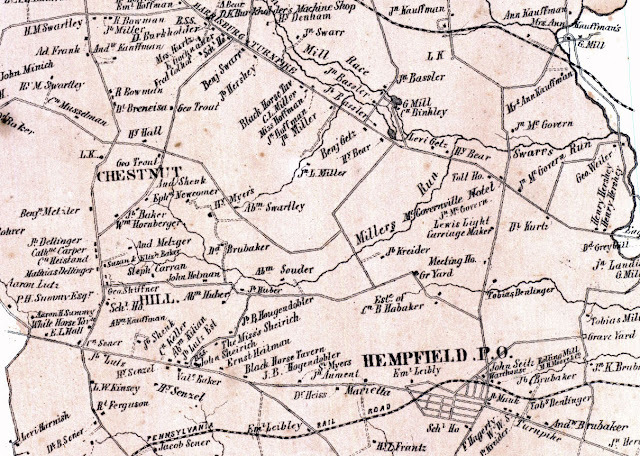 showing what is now Centerville and Rohrerstown ("Hempfield P. O."). until developed over the last ten or fifteen years. In today's letter, Corp. Elias H. Witmer (bio) of Company E, 79th Pennsylvania, who had already written seven letters to the Lancaster Express, took a sharp religious turn in his writing by sending a letter to the Church Advocate. Witmer's letter fits right into the distinctly American brand of evangelical Christianity that developed from the early 1700s to the late 1800s, with a special emphasis on the Second Great Awakening (early 1800s) and its intense fervor, conversions, revivals, and attempts to return to Christianity's primitive apostolic roots. 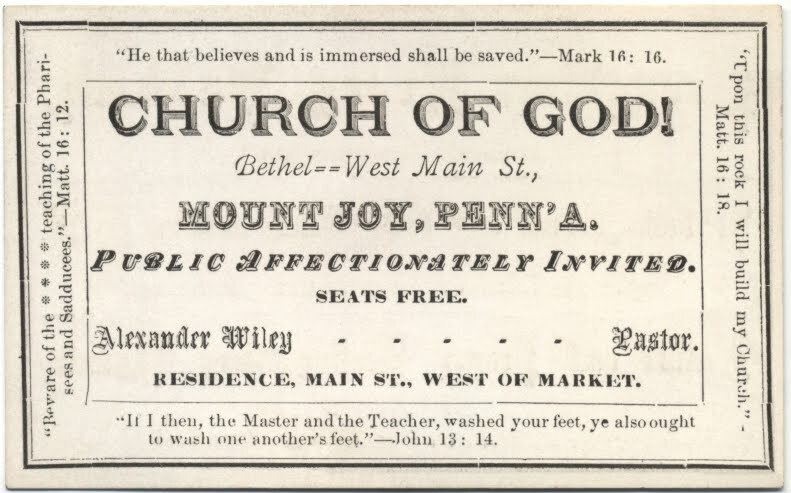 The Church Advocate was published in Lancaster as the organ of the Church of God (Winebrenner), a Baptist-like denomination active in southcentral Pennsylvania that split acrimoniously from the German Reformed Church a generation before the Civil War as part of this Awakening. I don't know of any pre-war connections between the Church of God and Witmer, a merchant from Mountville who looks to have a good number of Lancaster County Mennonites in his family tree going all the way back to Hans Herr. He might have belonged to one of Lancaster County's Church of God congregations, or he might have just written back to a newspaper whose message he supported regardless of denomination. Anyway, it's interesting that he adopts such a heavy religious tone in this letter compared to his Express letters, as it shows a relatively modern division between appropriate styles of discourse when writing to the general public (the Express) versus writing for a religious forum (Church Advocate). A couple recent studies of religion among Civil War soldiers have just come to my attention while researching this post, and hopefully after more data gathering from the 79th Pennsylvania I can say something about how the regiment's story fits in with the broader story. One enduring controversy is that Confederate soldiers were more pious than their Union counterparts, as some people can take this idea and run with it to make a variety of grand moral judgments. However, some historians have lately argued evidence shows greater piety per capita in the ranks of Union armies, although the whole framing of the historical question is somewhat silly. I'll be more interested in seeing what the mid-nineteenth century "marketplace" of religious ideas in Lancaster looked like, and how different soldiers 'and civilians' faith affected how they experienced the war and how they experienced the war affected their faith. I do have a letter, though, from the 79th Pennsylvania with food-related content written on this day in 1861. The following letter appeared in the December 7, 1861, edition of the Lancaster Inquirer. My hunch is that the correspondent, "Ipse Dixit," was Hospital Steward John B. Chamberlain, based on the content of an earlier letter and the fact that he later wrote to the Inquirer in 1862 under the alias, "Occasional." Mr. Editor:--It is some time since my [word unclear] literary contributions of adventures, by sea and land, of a "bold soger boy," adorned the columns of the Inquirer. But since I last wrote, circumstances intervened that have prevented me from writing. Nothing of special interest has transpired in the Lancaster County Regiment. From the interesting "Mount Guard," to the lonely picket stations; when night has settled down, and a cold rain or snow freezes the romance of war, and shakes the picturesque out of the soldier's wings of fancy, the men have all become hardened and inured. We have been under marching orders for some time--hourly anticipating a tramp for the sunny southern clime, the stronghold of secess's. This desire for a southern tramp is rendered still greater by the extremely fresh weather we have endured the past few days. Old Boreas blows a perfect gale from the West and North. This morning the the light feathery flakes of snow commenced to fall; covering the earth with one immense white mantle. It does seem as if we are to have a severe winter before us; but thanks to the careful attention of our energetic Colonel and Quartermaster, the men are all well clothed. We have just learned that the grumblers and growlers have written home that their rations are not regularly served, and not in accordance with the "Rules and Regulations of War." Now, this is simply untrue. There was necessarily some irregularity when we arrived at Camp Nevin, owing to defective transportation from Louisville; but in a few days this was remedied; and now no one can complain. The 79th has been peculiarly fortunate in the selection of its Surgeon, Dr. Wm. M. Wright, of Pittsburg. A more careful, efficient physician I have never seen. 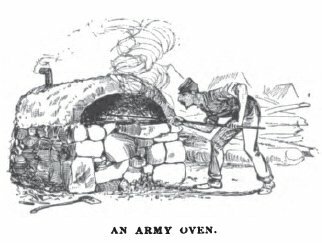 A few days after his arrival at camp, he held a large bake oven erected, in order to serve out fresh, wholesome bread to the men every day, instead of the army flour hitherto supplied, and the usual quantity of hard biscuits. I give below the rations supplied to every 100 men: 15 pounds of sugar; 8 lbs roasted coffee; 10 lbs rice homony, or 8 qts. beans; 137.5 lbs fresh bread or 100 lbs hard bread; 125 lbs fresh meat, 100 lbs bacon; vinagar 1 gal. ; salt 2 qts. ; adamantine candles 1lb; potatoes once or twice a week, according as they are issued by the Brigade Commissary. Fresh bread is issued every three days out of five--two days, the hard is furnished. Fresh meat is furnished the same as the bread. The Regimental requisition is generally made out for five days. Now who can say after this, that Hambright's or any other regiment is not supplied with the best. Your readers would be astonished at the immense number of soldiers pouring daily into the dark and bloody ground of "Old Kaintuck." It requires all the ability of General Buell, seconded by an able corps of assistants, to properly dispose of them. It would seem as if the War Department has become fully alive to the importance of Kentucky as a strategic military position, and is determined to attack the South in its most vulnerable points. When we do move it will be with a force of from 150,000 to 200,000 men; and we betide any senseless dolt, either Zollicoffer or Buckner, who attempts to impede our onward march. Your paper is a most welcome visitor to our camp. Everybody wants to have it first; and inducements are held out, and persuasive eloquence used, that would turn the heart of the greatest pettifogging lawyer in Lancaster. I was much pleased to see, by The Inquirer, the presentation of a handsome sword to our old friend Lieut. Jacob S. Duchman, by his fellow members of the Union Fire Company. It was a compliment well bestowed, alike creditable to the donors and recipient. The Big "U" boys never appear to tire of well doing. Not satisfied with sending nearly all her active members into the tented field to fight for that other "Union" we all love so well, the remaining few still manifest their appreciation of a good member, a fine officer, and their patriotism by the bestowal of this appropriate testimonial. 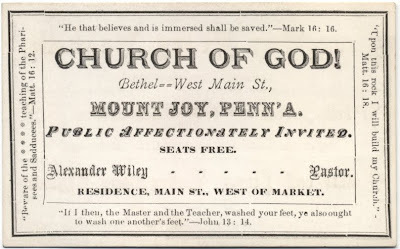 Card for Mount Joy Church of God from 1870s. Back to the Church Advocate for today's letter authored by Pvt. Flavius J. Bender, formerly of Mount Joy, Lancaster County, and lately of Company C, 77th Pennsylvania. I'm posting it two days early as there's a 79th PA letter also written on November 24, 1861. 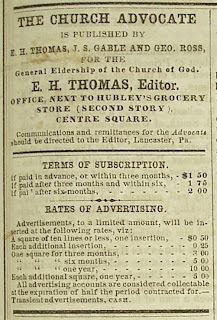 In the way of reminders, the Church Advocate was a religious newspaper published in Lancaster by the Church of God (Winebrenner), a Baptist-like offshoot of the German Reformed Church, and the 77th Pennsylvania was one of three regiments (including the 78th and 79th Pennsylvania) that initially formed Negley's Brigade. Look forward to some excitement, with good and bad news from the regiment, as they strike tents and march South on November 26, 1861. Today's letter affords us our first opportunity to hear from Col. Henry A. Hambright, leader of the Lancaster County Regiment. Over the course of the war, we get the sense that his duties running the regiment and filling brigade-level roles assigned by Gen. Negley kept him extremely busy, so don't expect the same level of introspection that has characterizes Corp. Witmer's and Lieut. Nevin's letters. In fact, the letter Col. Hambright wrote on November 19, 1861, aimed to deny and crack down on rumors coming out of his regiment that caused a little stir in Lancaster. The rumors that so infuriated the commander of the 79th Pennsylvania essentially were communicated by certain soldiers in the regiment and said that certain officers in the regiment were worthless and frequently drunk, and about to be kicked out of the regiment. I actually haven't been able to find any corroborating sources--private or public--from November 1861 so it must have flown under the radar and stayed out of the newspapers (although I could have missed something). I don't know who the "recruit" or "schoolmaster" was that Col. Hambright mentions, although it's possible it involved J. P. McCaskey the Lancaster Boys High School who we know was pretty deeply involved in 79th Pennsylvania controversies later in the war. But that's just speculation, as there were a large number of education-related temperance-sympathizing soldiers, including just about all of Company E.
The letter also reminds me that I don't really know much about disciplinary actions within the regiment and the negative side of army life--drunkenness, desertions, and incompetence--which for the most part stayed out of Lancaster's newspapers. Perhaps some of the more official documents in Harrisburg or Washington can illuminate. 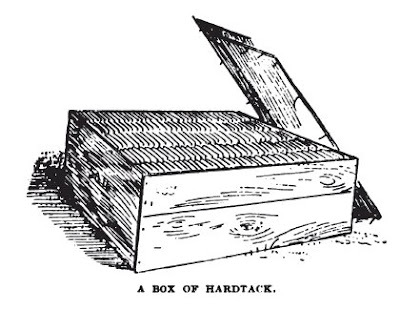 As soon as the Lancaster County Regiment settled into its Kentucky campground, a steady stream of boxes began to flow from Lancaster to Camp Nevin to help supply the soldiers of the 79th Pennsylvania with necessary clothing, minor luxuries, and the warm wishes of folks at home. Shortly after the war began, the women of seemingly every Lancaster County village and town, spearheaded by the city's Patriot Daughters of Lancaster, formed aid circles to collect canned goods, clothing items, and medical supplies to send to Lancaster soldiers in Eastern and Western Theaters and army hospitals in need. 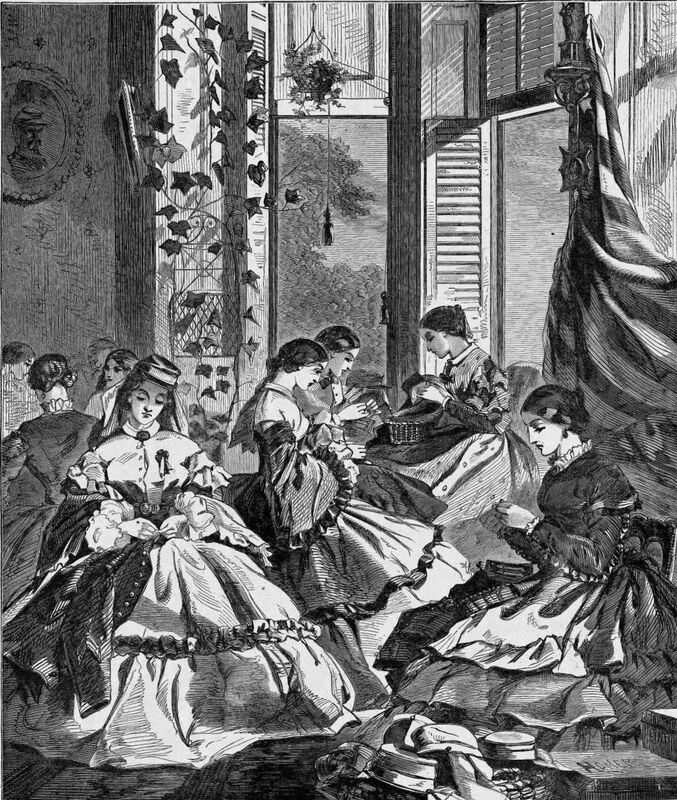 Aid efforts represented a very practical way in which wives and mothers kept in touch with soldiers in Kentucky and expressed their loyalty to the nation and the war effort. On October 25, an announcement followed that they were still 500 pairs short of their goal, despite contributions of up to twenty-six pairs from some ladies. Other lists appeared in the November 30 and December 4, 1861, Daily Evening Express specifically for socks from East Earl Township, Carnarvon Township, Lancaster City, Enterprise (Bird in Hand? ), and Binkley's Bridge (where Rt. 23 crosses the Conestoga). (alternate link) Among the names of cash and food donations, we see many prominent citizens--wives of judges, doctors, etc.--but I'd be curious to know if the sock donations came from a broader class of citizens. 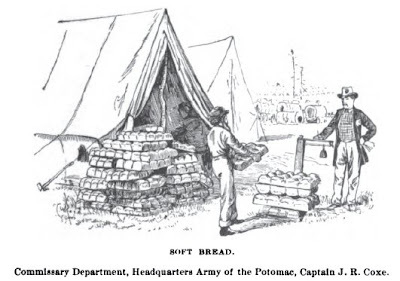 Responses to aid efforts by soldiers in the 79th Pennsylvania. Antagonism between Lancaster City and Lancaster County, primarily in the form of antipathy toward (especially Amish and Mennonite) farmers who many felt were not contributing their fair share to the nation in need. Special Christmas-related aid efforts (Hint: it involves lots of sauerkraut for Col. Hambright's regiment). First Colors of the 77th Pennsylvania, over which Cols. Hambright and Stumbaugh contested. In early November, Lancaster's newspapers and almost all the soldiers mention a brief controversy involving Col. Hambright and Col. Stumbaugh of the 77th Pennsylvania. Basically, when Gov. Curtin presented flags to Gen. Negley's brigade in Pittsburgh, he got mixed up in what he said and did in giving numbered flags to Col. Hambright's and Col. Stumbaugh's regiments. Both subsequently claimed to be the 77th Pennsylvania, which entitled them (at least that appears to have been their impression) to be the brigade's ranking colonel. In the end, Gen. Negley stepped in to placate Col. Hambright, and the controversy ended up not mattering anyway due to Gen. Buell's late November reorganization of the Army of the Ohio in which he split up units from different states to make it more difficult for governors to meddle with his army. It still shows some of the intricacies of mobilizing volunteers in the North, how Col. Hambright made an impression on his men, and personality politics of the generals and colonels in the Army of the Ohio. 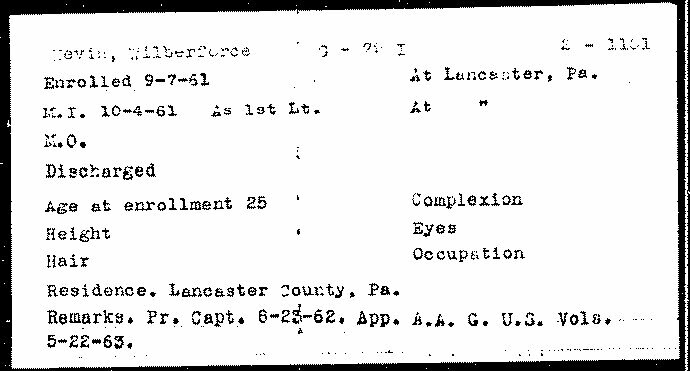 Listed below are what some soldiers of the 79th Pennsylvania recorded about the incident. What does the people think of our being sent to Kentucky? I suppose they think we will have a fight soon. It looks as though we should have a fight among ourselves first. A contemptible second rate lawyer who has little over half a Regiment (Stombach) claims our colours, which is marked 77th Regiment. His flag is marked 79th Regiment. 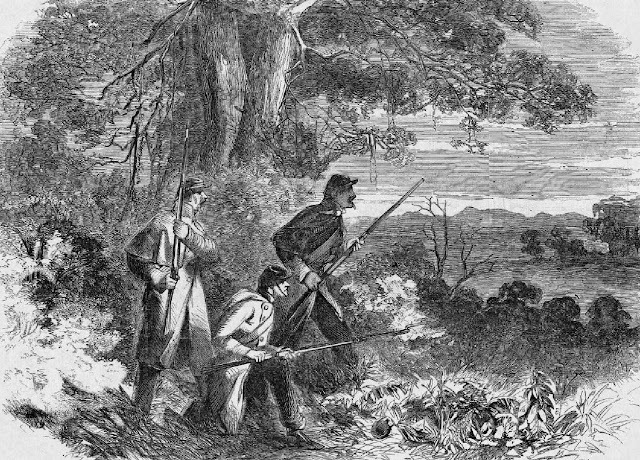 His soldiers are a mere militia Rabble and he is not fit to have charge of so many big dogs, but by some Political hocus pokus has got Governor Curtin to send an order for Col. Hambright to give up our Flag. The Col. says he will die by it First and so the regiment says also, which makes things look blue. This morning we drilled the Skirmish Drill for the first time & done very well. In afternoon we were drilled by Battallion by Col. Hambright & formed a hollow square. Every since this Brigade was formed there has been a disagreement between Gen. Negley & Col. Hambright in regard to his place in the Brigade. Col. Hambright thinks that he having his Commission first is entitled to the first place in the Brigade. Gen. Negley however thinks differently & says that Col. Stambaugh has the first place and he has not more then half a Regiment yet. Gen. Negley is trying to starve us into the last place. You asked me in your letter in regard to a difficulty between Col. [Frederick S.] Stambaughs and [Col. Henry A.] Hambright's Reg. in regard to the Flags[.] there was some trouble for a while. 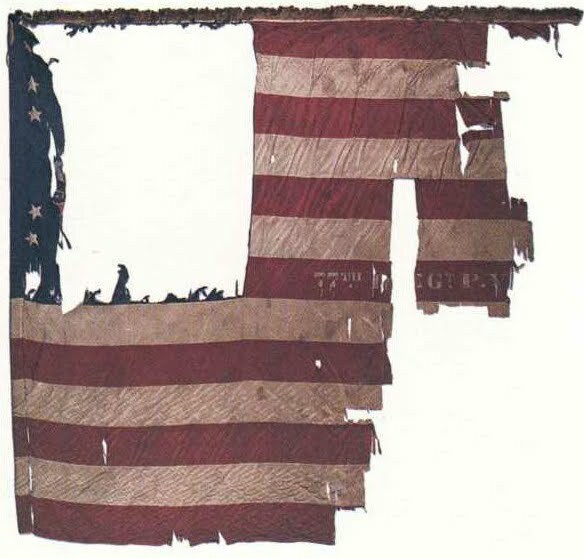 I learn upon inquiry the following: that the Governor [Andrew Curtin] in presenting made the first error in giving the Flag marked 77th to our Col. the mistake was not discovered until we arrived at our present Camping Ground, when Staumbaugh demanded the 77 flag and insisted that Hambright should take the 79th flag[.] Hambright made this reply which was rather in the Spartan Style[:] come and take it but at your hazard. The battery was attached to Negley's Brigade at Camp Nevin. 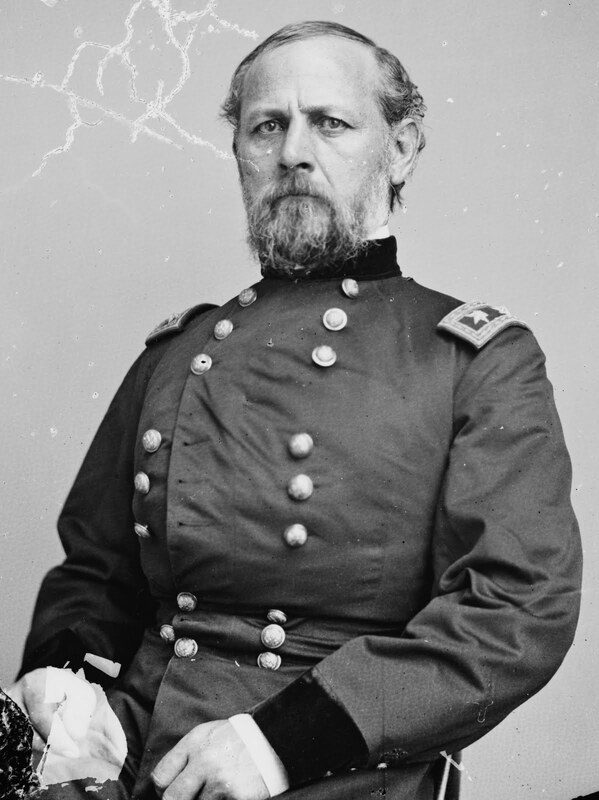 Today's letter again comes from Camp Nevin, but show some signs of itching to move on to the target of Bowling Green, Kentucky, and Confederate forces under Gen. Simon B. Buckner. Although the letter is missing a signature, its tone and content convince me it's from the pen of the Daily Evening Express's normal correspondent, Corp. Elias H. Witmer. On November 9, 1861, Gen. Don Carlos Buell took over command of the Army of the Ohio from William T. Sherman. The brigade of Pennsylvanians that included the 77th, 78th, and 79th Pennsylvania under Gen. James Negley was assigned to the division of Gen. Alexander McCook. Attached to Negley's Brigade was Independent Battery B, Pennsylvania Light Artillery (aka Muehler's Battery, 26th Pennsylvania Artillery), in which Thaddeus Stevens' nephew and ward Alanson J. Stevens was an officer. It was recruited in Franklin and Erie Counties, and I don't know if I can verify Witmer's assertion that it was "manned entirely by Germans." Witmer's description of praise for Col. Hambright's regiment is among the first of a long parade of compliments the regiment would receive for its appearance and proficiency. 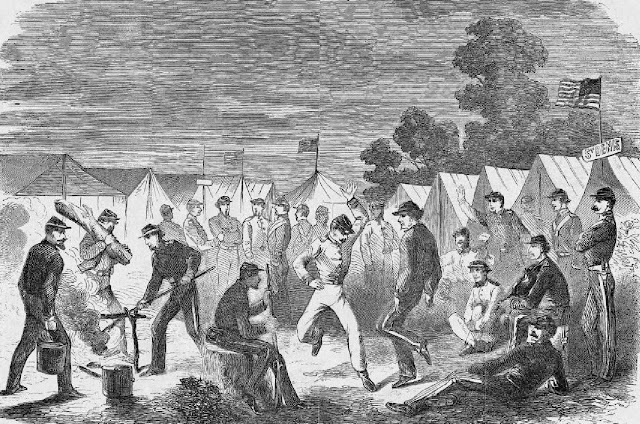 The lightning strike of a tent in the 77th Pennsylvania's camp was described in a letter from last week. Witmer offers pretty strong support for Gen. John C. Fremont and his preliminary emancipation proclamation in Missouri, which drew the ire of Washington. In the complex and evolving opinions soldiers in the 79th Pennsylvania felt about race, slavery, black soldiers, etc., Witmer's comments are an important data point. Amateurs Talk Strategy; Professionals Talk Logistics. Here's a post that brings my avocation a little closer to my vocation, and hits on three significant (and basically lost to history) happenings that impacted both the lives of people living in Lancaster during the Civil War and the execution of the Union war effort. 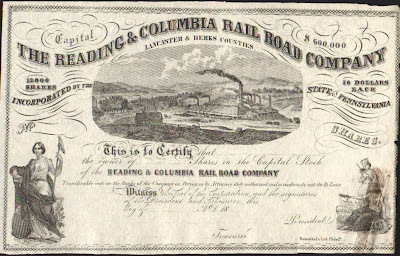 First, construction began in 1861 on the Columbia and Reading Railroad, which ran across northern Lancaster County primarily to complete a New York-Baltimore connection and allow for the more direct shipment of coal from Pennsylvania's mines to Baltimore and beyond. Discussions and legislative work dated to 1857, and a note in the November 2, 1861, Daily Evening Express stated almost twenty miles of track were ready to be laid and bonds were about to be issued. The railroad would be completed in late 1863. 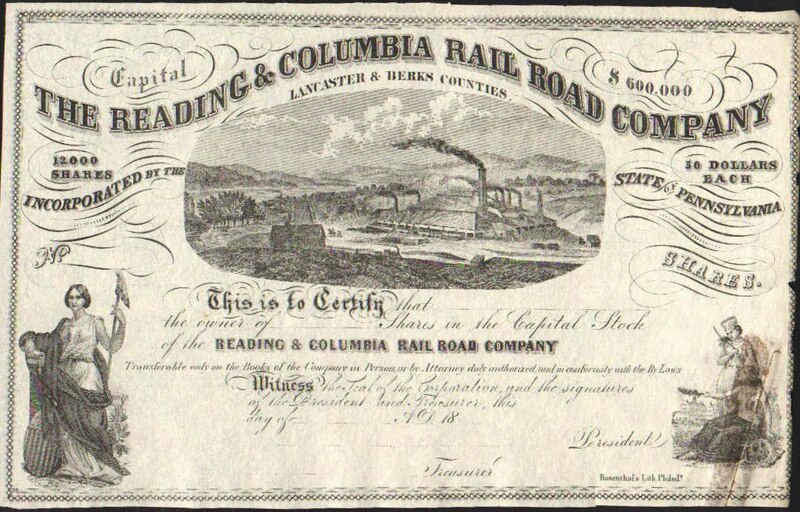 Here's a quick history of the Columbia and Reading Railroad. If you want to dig deeper, the digitized Columbia Spy looks to have some really good information if you simply search "Columbia and Reading Railroad." The operation of breaking the mules for the teams seems to be the most attractive feature of the place. This department is under the charge of a Mr. Emmonds, assisted by about thirty colored men. About thirty teams are turned out daily. The mules are put into a small pen, from which they are driven into stocks or stalls. Here they are secured somewhat on the Rarey plan, with a rope to each front leg, one round the back, through which one of the ropes on the front leg is passed. The bridle and collar are then put on, the collar by unbuckling it at the top. After this they are let into another apartment to receive the rest of the the harness. Most of them rare and pitch furiously, but are immediately brought to the ground by men at the ropes. This is continued until the mules submit. Some yield at once. Others require more time. After being subdued, the rest of the gears are put on, and the rope taken off one of the legs. As soon as hooked into the wagon, the remaining rope is also removed. Broken mules are taken for the saddle and line, and are hitched in before the new ones are brought to the wagon. As soon as the team is full, which is usually fitted up in from ten to fifteen minutes, two of the colored men drive it round, with two wheels checked, until the mules are quiet, when it is given into the teamster's charge. The new wagoner continues driving it every day, with one, if necessary, both wheels locked, until he has perfect control of his team. The gears, mules, line, &c., are arranged precisely like the Conestoga or Lancaster county farm teams. The driver rides the left hind mule, with a single line attached to the leader. The mules are not beaten during the process of breaking, as has been generally reported, though some drivers may occasionally abuse them while working with them. That some "hard swearing" is sometimes indulged in may by inferred from the remark of one of the Germans from Lancaster, who is here as a teamster, that all the mules had one name--"Soon uv a beatch!" 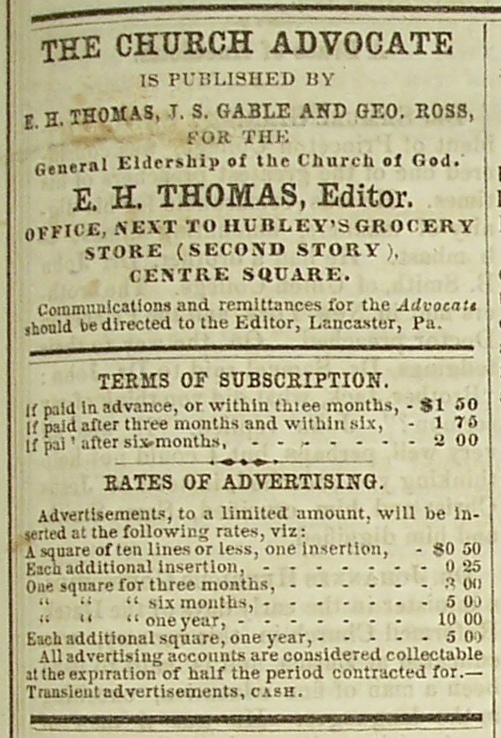 Finally, I've noticed a good number and wide variety of war-related contracts being noted in Lancaster's newspapers of late 1861 along with advertisements for workers. Shoes, clothes, lumber for bridges, rifles (and I think cannons from Safe Harbor's iron works), and wagons all were supplied from Lancaster. One that got a good bit of attention was an order for 100 army wagons completed basically in November 1861 by Cox & Co. at the corner of S. Duke and E. Lime, which the Daily Evening Express noted "is giving employment to a large number of workmen; and has set to work much otherwise unemployed machinery." (11/7/1861) In a November 30 article, the Express praised the wagons' quality and commented, "The principal object was to give employment to a large number of mechanics, and to distribute some $10,000 in this community." The wagons passed inspection with flying colors, and fifty teams of six mules each traveled from Perryville to Lancaster on December 17 to retrieve the wagons (DEE 12/17). The ABC's for Lancaster's "Babies of the Early Sixties"
Gen. Don Carlos Buell, who took command of the Army of the Ohio (which included the 79th PA) on November 9, 1861, and would lead it for almost a year. He was replaced after the October 1862 Battle of Perryville and probably had lost popularity by the time Johnston's poem was written. As yesterday was the 150th anniversary of a major personnel change in the Western Theater--the replacement of William T. Sherman with Don Carlos Buell as commander of the Army of the Ohio--I thought it would be a good time to familiarize ourselves in a creative way with some of the names that became well-known to soldiers of the 79th Pennsylvania. The following poem was written by Lieut. 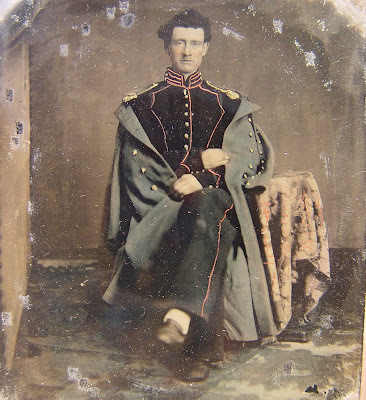 John M. Johnston of Company K, 79th Pennsylvania, sometime in fall 1863. Johnston was one of Lancaster's first photographers before the war and an editor at the Intelligencer after the war. He lived in the city's Northwest Ward with wife Jane and four children, including one-year old Herbert, as of the 1860 census. Some of his war accounts were published posthumously in the 1890s by a family member, and this poem was appended to a lengthy account of the Battle of Chickamauga published in 1892. You'll notice a Democratic slant to his epithets (e.g., George McClellan, modest?). How the Rising Generation of the Early '60's Learned Their A, B, C's. This is the way the babies of the early sixties learned their "A, B, C's" in Lancaster. 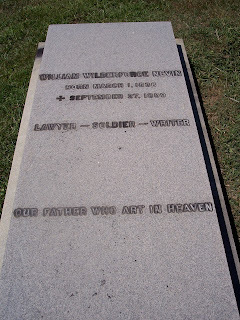 It is needless to add the rhyme was written shortly after Chickamauga; that its writer was a soldier of the Seventy-ninth, and that his devotion to the glorious Army of the Cumberland was part and parcel of his good will to fellow men and to his country. Z is for Zagoni, a great charge he lead. In November 1861, a final group of men recruited for Col. Hambright's regiment as a company led by Capt. Frederick Pyfer, a lawyer from Lancaster, arrived in Kentucky. With Hambright's regiment full, they ended up as Company K in the neighboring 77th Pennsylvania under Col. Frederick S. Stumbaugh of Chambersburg. Anticipating the arrival of this group of men including Lieut. Ben Ober, former local editor of the Daily Evening Express who would soon resume contributing his own letters from the army, another soldier who served as the 77th Pennsylvania's quartermaster penned a letter from Camp Nevin. Lieut. Jacob E. Cassell is listed as a farmer in Upper Swatara Township of Dauphin County with five children in the 1860 census, although his service record lists his residence as Lancaster County. He later would write one of the Lancaster newspapers' more dramatic letters of war telling of his adventures of the Battle of Stones River in early January 1863. Today's letter comes from a new soldier, Pvt. James H. Marshall of Company K, 79th Pennsylvania, in a new Lancaster newspaper, the Examiner and Herald. Although Marshall (bio) was a prominent veteran in Lancaster, you might best relate to as the brother-in-law of William S. and J. P. McCaskey (after whom Lancaster's J. P. McCaskey High School is named). I'll probably do a biographical post on Marshall sometime in the future on the anniversary of his wedding while home on furlough in May 1863. The basic content of the letter introduces us to a company we haven't heard much about, Company K, commanded by Capt. 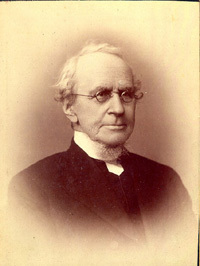 Jacob Gompf. 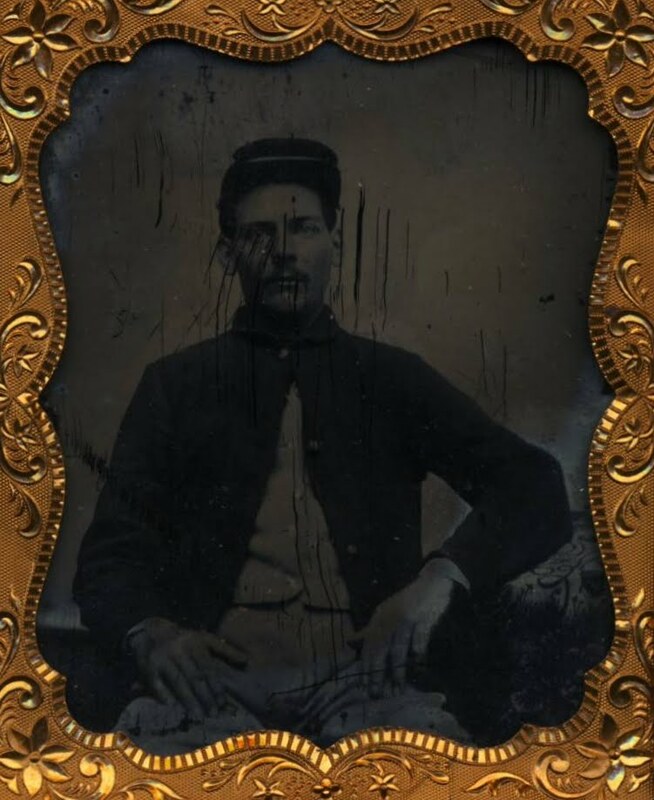 It was a private in Company K, Bernard Short of Martic Township, who was the first 79th Pennsylvania soldier wounded by a bullet when he lost a finger due to the accidental discharge of his musket. Marshall continues other correspondents' descriptions of camp life, and mentions a controversy I'll soon address between the colonels of the 77th and 79th Pennsylvania. The Examiner and Herald editors appended a letter from Captain Gumpf about apparently false rumors that we was to be replaced. Today's letter by Corp. Elias H. Witmer (bio) of the "Normal Rifles"--Company E, 79th Pennsylvania--continues the string of letters from the regiment's first camp, Camp Nevin, fifty miles south of Louisville, Kentucky. Almost two weeks into the regiment's stay, not much exciting happened with the exception of picket duty and an occasional false alarm. The ten companies of the 79th Pennsylvania rotated the duty during their time at Camp Nevin. With the coming winter and a few days of torrential rain in early November 1861, descriptions of picket duty as a glorified picnic disappeared. 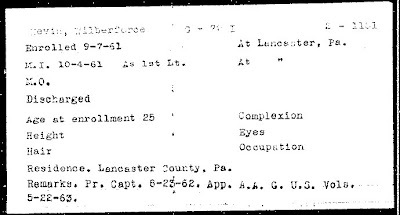 Recruiting efforts continued in Lancaster, and although advertised as for a new company in the 79th Pennsylvania the new recruits seemed to end up in one of the neighboring Pennsylvania regiments as Company K, 77th Pennsylvania. 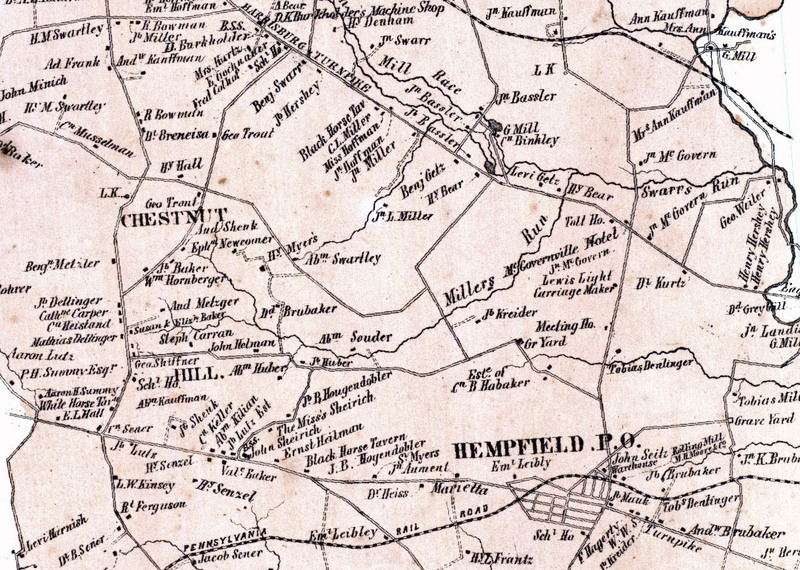 The controversy that Witmer mentions would continue between various parts of Lancaster County, normally through accusations that farmers (which seems to always imply a prosperous class of citizens) lagged behind in contributing men to the army. Such criticism reached its height and began to matter practically when drafts were instituted in fall of 1862 and summer of 1863. Occupation: Lawyer since 1859. Before that, teacher in Sewickley, PA. Term of Service: Enlisted September 23, 1861. Promoted to Captain, August 23, 1862. Assistant Adjutant General on May 26, 1863. Post-war: Lawyer, newspaper editor, railroad man. Death: September 27, 1899. Buried in Woodward Hill Cemetery. Continuing the trend of 79th Pennsylvania line officers having immediate family members at the forefront of education in Lancaster (i.e., McCaskey and Wickersham), this post introduces Lieut. William Wilberforce Nevin (bio) of Company G, 79th Pennsylvania, hailed as "a patriot, a scholar, a gentleman." The son of a distinguished German Reformed theologian and future president of Franklin and Marshall College, Wilberforce Nevin graduated at the top of his class at F&M in 1853. His occasional letters as an officer in the 79th Pennsylvania to the Daily Evening Express exhibit enviable eloquence and reflect a distinguished career that spanned education, law, newspapers, and railroads. Nevin joined the 79th Pennsylvania in September 1861 as one of three lawyers who recruited and led what became Company G. After the war, Nevin continued his work as a lawyer in Lancaster, and his name appears regularly between 1865 and 1867+ as an active participant in Republican politics and veterans organizations, as well as working pro bono as a lawyer for veterans. He became a journalist for the Lancaster Daily Evening Express and later for the well-respected Philadelphia Press. 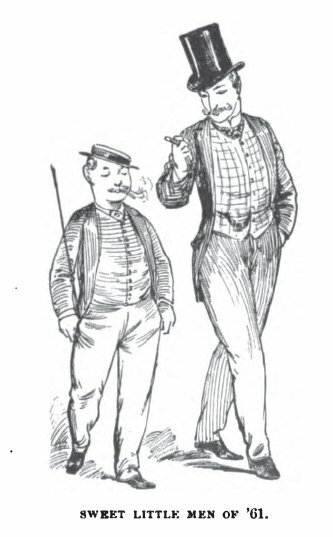 Nevin spent the years 1879 and 1880 traveling in Europe and published his travel memoirs, Vignettes of Travel. You can view a particularly interesting chapter, Chapter 5 beginning on p. 36, comparing Lancaster, Pennsylvania, as he knew it with Lancashire, England. Later, Nevin moved to New York to work on behalf of railroads until shortly before his death in 1899. Although I don't know much about Nevin's religious beliefs, his father is very interesting for having played a central role in one of the major conflicts of religion in America: the mid-nineteenth century clash between confessionalists and pietists that would help determine the character of Protestant denominations. Loosely speaking, confessionalists advocated a more conservative understanding of the key theological formulations of the Reformation, while pietists favored a more "American" approach that emphasized revivals, conversion stories, and modern ways of expressing faith typical of the Second Great Awakening. While this may sound dull, it's actually a very fascinating topic to watch unfold, especially for anyone trying to understand Christianity in all of its forms today. I'll have more about this debate--especially as it relates to addressing the issue of slavery--when the Lutherans' national body convenes in Lancaster in May 1862. Anyway, Wilberforce's father, John Williamson Nevin, made a name for himself as a "High Church Calvinist" while a seminary professor in Mercersburg, Pennsylvania. During the 1840s, Nevin and a colleague attracted attention as proponents of what became known as the "Mercersburg Theology." A bitter adversary at this time was a man named John Winebrenner, who essentially seceded from the German Reformed Church to create the Church of God, a more evangelistic, Baptist-like organization. Winebrenner operated mostly out of Harrisburg with many churches in Lancaster, as well as the Church Advocate newspaper. Wrapping up this tangent, this is the newspaper to which many soldiers wrote, including F. J. Bender regularly and E. H. Witmer on two occasions. So, when trying to understand the religious world in which Civil War soldiers lived, it's important to recognize them as the children of the generation that faced many high-level choices and conflicts about the direction of Christianity in America. Back to W. Wilberforce Nevin, I hope you enjoy reading his letters as the secondary correspondent (to E. H. Witmer) to the Daily Evening Express, and are impressed by the authority with which he yielded his pen. It looks like there will be two more over the next two months. Apparently, a collection of W. W. Nevin's private letters to family members are housed in the Library of Congress, but I have yet to view them despite a deep desire to do so. By the way, you might also be familiar with the sculptures of Wilberforce's sister, Blanche, including the Reservoir Park lion in Lancaster and the horse drinking fountain at the corner of W. Orange and King Streets. See my Google Books library for books written by John Williamson Nevin. Since today marks the three-month anniversary of my first post, I thought it would be good to offer an opportunity for readers to ask any question about Lancaster County, the 79th Pennsylvania, and the Civil War. As I've touched on many topics, are there any background questions that could make things clearer for you? Also, what would you like to know about Lancaster in the 1860s or the regiment that it sent to war? Something about life in Lancaster at the time? The grand military strategy? The politics? The technology? The officers and men of the regiment? How to do research? I'll be happy to do some digging, try to patch together an explanation of something, find a relevant source, or just flat-out make something up. Post a question in the comments section below or on the blog's Facebook page anytime between now and the end of November. It's a fascinating topic to me, so I look forward to the conversations!